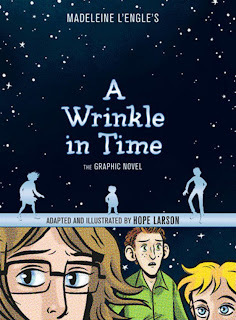 The classic middle grade book gets a solid graphic novel treatment by award winning artist Hope Larson. The weird thing about graphic novel adaptations is that they tend to be much longer than their source material, and they rarely convey all the details and explanations in their retelling. 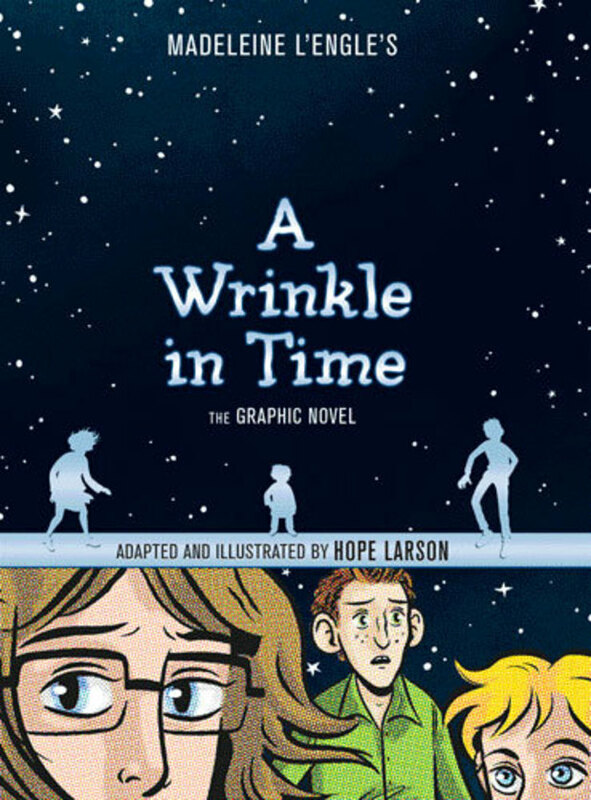 Graphic novels conceived as graphic novels from the beginning work to condense story where adaptations, it seems, look to open up narrative, alternately speeding along the story and slowing it down at the same time. There's a certain elasticity of time and events involved. 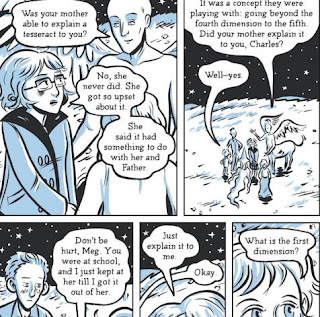 Could there be a better-suited book for a graphic novel treatment than A Wrinkle in Time? Meg is an odd duck, rendered here like your typical unruly tomboyish nerd girl. Impatient and impulsive, she doesn't fit in even among her family; her mother has beauty that she envies, her twin bothers the model of normality, and her baby brother Charles is a precocious clairvoyant mistaken by those around him as a moron. Her father? Mysteriously away, subject of much gossip, though truly gone in a way the local townfolk could never conceive (much less believe) if they knew the truth. Charles is in contact with some old ladies who live in a house in the woods most consider haunted. Mrs. Whatsit at first seems like a doddering old fool, her companion Mrs. Who speaking often in quotation, and eventually the occasionally unfocused apparition Mrs Which presents, taking the form of a Halloween witch. Together, these tree form a trinity of Star Sisters who serve as prophets, guides, and guardians for the journey about to come. A classmate of Meg's, the sensitive outsider Calvin who is better at passing as normal, finds himself drawn to the haunted house in the woods and once united with Charles and Meg they are informed that they can help bring Meg and Charles's father but that the mission involves some peril. Traveling the wrinkles in time, the sextet make it across the galaxy to the planet Camazotz where a cloud of evil is holding the kid's father as a prisoner. This evil has grown and crept across the galaxy, threatening to force the inhabitants of other planets to succumb to fear and remain orderly and obedient. This evil is controlled by IT, rendered as little more than a massive brain sitting on a pedestal in a protected tower. Utilizing their wits and few tools left them by the Star Sisters they rescue Meg's father but at the expense of losing Charles in the process. They regroup at a safe distance and discuss options for rescuing Charles, where Meg finally comes to realize that this is her destiny, and enters a final confrontation with IT using as her weapon the one thing IT wants but IT doesn't have. I'm going to admit right here that I am as old as this book, and that I read it when it was less than a decade old. I have vague memories of images from that initial reading that have, over time, merged with images from episodes of The Twilight Zone and The Prisoner, bits and pieces from other science fiction stories (Bradbury and Clarke most likely), and special effect from the occasional badly produced movies that would end up on TV in the afternoons on weekends. Which is to say that the material read fresh to me while at the same time oddly derivative. But more startling to me was the complete mash-up of Cold War fear, Orwellian dystopia, post-war mythology, and a solid dose of budding New Age religious thinking. None of this is negative or unwelcome, as I was suddenly aware of how tame and safe a lot of middle grade fiction is these days by comparison. Talking time travel as if it were as easy as breathing, quoting classic scholars and thinkers, lumping artists and religious icons together as visionaries who have tried to explain the unexplainable... after a while it was a little like the articulation of thoughts from someone gloriously tripping on LSD. Again, not a bad thing, but odd all the same. I applaud Larson for taking on a classic that, like movies made from books, will no doubt disappoint those who have set ideas of what the characters look like or how certain elements should be rendered. It's also no small feat to take on the telling of a story that has as its base the notion of time travel without any real explanation for how it is possible. 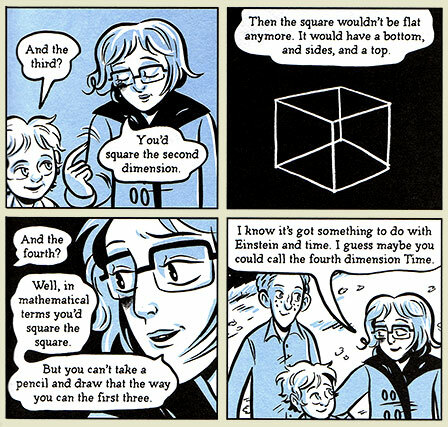 Merely referring to "the tesseract" and giving a basic description of how travel across the fifth dimension could easily lose a reader, but the story is carried along by the strong-willed personality of Meg and her through-line desire of finding and rescuing her father. As excited as I was to get my hands on this I had a little bit of graphic novel adaptation remorse after finishing it – I probably should have reread the original novel first and made a true comparison. But I've thought this over and decided that as much as I'd like to think of graphic novels as gateways to reading in general I sincerely doubt a majority of readers are going to read both: unlike book-to-film interest there is little evidence of a similar graphic-novel-to-book conversion taking place. We can debate and discuss this all we want, but the reality is what it is, when a kid finishes a book they don't generally go hunting down the graphic novel adaptation, and vice versa. With that thought in mind I am glad there is this second, and perhaps slightly more accessible, graphic novel version of A Wrinkle in Time out there. It provides more opportunities to open up young minds and getting their heads wrapped around the notion of time travel and just what intangible is truly the most powerful weapon in the universe. Besides reading, of course. I believe you're right - if they've read the graphic novel, most kids won't track down the original novel, but it could happen - after all, there have been occasions when my kids have tracked down a novel after seeing a movie adaptation, sure that some of the "good stuff" got lost along the way. It seems more likely that kids who love the original novel might, however, track down the graphic novelversion, though. Interesting topic.